Once in a while, there is a product so wonderful that it truly leaves me speechless and Bears By Lauren just did exactly that. When I opened up our special package and laid eyes upon the teddy bear made just for my six son, Jacob I was overcome with emotion about this special treasure. When my son saw his new friend……he cried and said it is “the most awesome bear in the whole world!” What makes a keepsake bear from Bears By Lauren so special? Every bear from Bears By Lauren is handcrafted and personalized to order so it is sure to become a beloved treasure for any boy or girl, young or old. Lauren handcrafts each bear with exquisite attention to every single detail. Each bear is unique and can be made from a special fabric or even from a piece of cherished clothing or blanket. You can even request specific features, themes or designs. I create Jacob’s memory bear to represent the things that he loves such as fishing. Lauren was able to find a super soft material made out of an ocean theme and it even included his favorite color, orange. She embroidered his initials “JAR” on one foot of the bear and a cupcake on the other foot as this was a birthday gift for him. What really makes “Beary” so endearing and special to Jacob is that she was able to replicate from a photo a major burn scar on the bear’s arm which matches the one on my son’s arm. It is so realistic looking and Jacob actually jumped up and down with excitement when he noticed it, saying “Mommy, look……my bear is just like me and got burned in a fire!” From the expressive eyes to the pretty bow wrapped around the bear’s neck this bear is just extraordinary and I am confident it will be a friend in Jacob’s life for a very, very long time! It far exceeded my expectations in terms of craftsmanship and quality. Jacob’s bear sits on a shelf next to his bed and he loves to talk to his friend and even reads the bear a story every night before bed. There really is no limit in terms of what Lauren can create for your special order. The bears can represent a sports team, club, school, special events and more. My favorite idea is to create a bear to celebrate a loved one who has passed away….what a unique and special memory gift that is sure to be bring joy to the recipient. You are invited to visit Bears By Lauren to browse the collection of memory and keepsake bears. What will be the inspiration for your bear creation? I can promise you that when you see your personalized bear come to life….it is absolutely unforgettable! Connect with Bears By Lauren on Facebook, Twitter, Instagram and Pinterest. How adorable. And the colors on this bear are so cute. My niece loves stuffed bears and this would be a good one to get her! I am definitely going to have to go check her site out. The bear is adorable and I love that they can be personalized. Wow!!! These are so cool! My daughter LOVES teddy bears, I am def going to check this out thanks so much for sharing this! Hi, Thank you for such a great review. I was a pleasure to create this wonderful companion keepsake bear! You can get 20% off through 10/27 using code “FALL”. What an amazing idea! 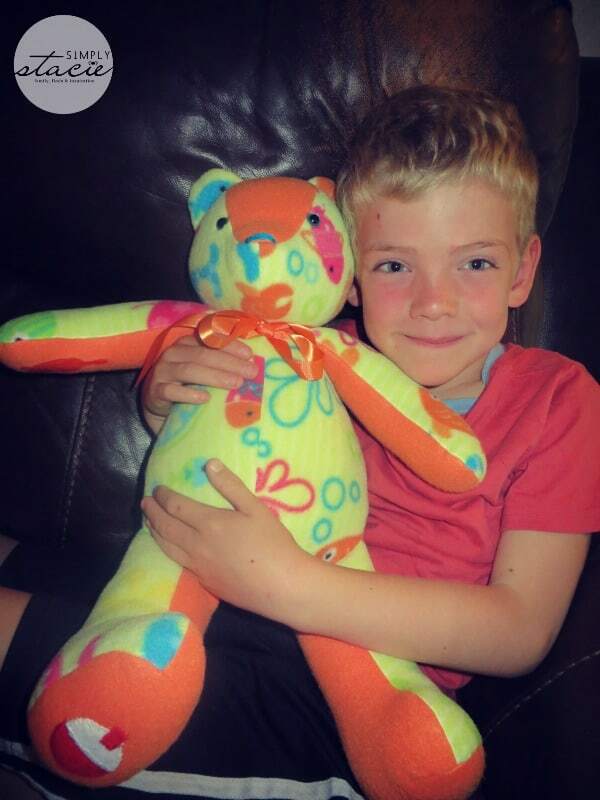 Personalized bears that make each child feel special and identify with the toy! Happy to hear Jacob loved his bear! they truly are amazing and Lauren does an amazing job on them, I especially love how they are personalized just for you!!! That is such a great story of how the bear’s fabrics can be chosen and then similarities put on it for your child. Amazing. Personalized bears are so sweet! What a lovely idea. A special gift for someone special. I love the idea of personalized bears. They are adorable and would be loved by any child!! Simply gorgeous! Love the concept, designs, and of course, the fact that it’s a bear! I would love to have this for my grandbaby. Awesome. THey look so soft and cuddly. My grandson wears 2 hearing aids, I wonder if I could have a bear made with hearing aids, that would make my grandson so happy! Wow, now that is one meaningful bear! I love the idea – it’s so neat! So creative…I love this idea! So many possibilities to capture treasured memories. Sweet Bears! What a great way to make a very special bear for someone. This such an awesome idea and service. I love that there were so many special touches for your son. BTW: He sincerely looks adorable with his bear. Thank-you for the information and review! What a beautiful bear, I love the matching scars! When you get something that is that well crafted and personalized with so much attention to detail, well it makes a lot of what we buy seem almost silly! Great gift idea, especially when personalized! Xmas, new baby…. 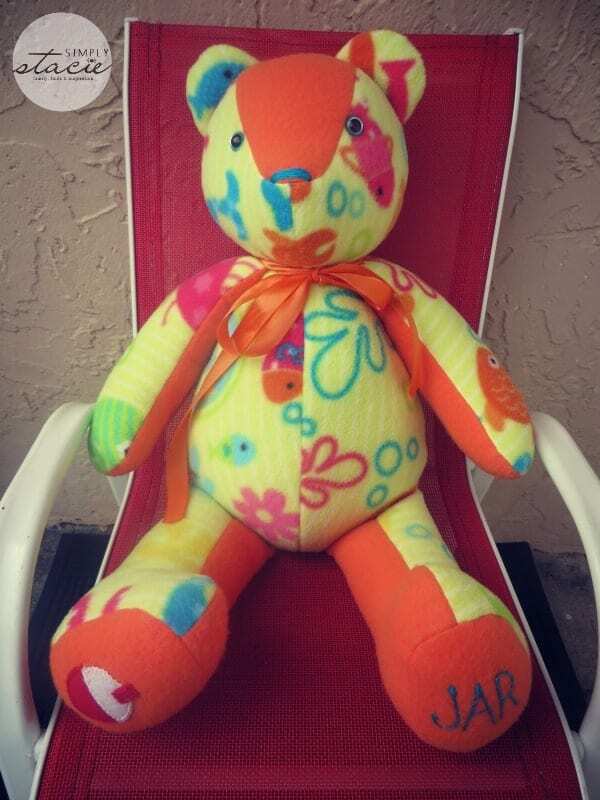 The bear is so cute,I love the colours and its great that they can be personalized.